eggs - 0, taste - 10! A friend recently asked how she could an omelette without using eggs. The easy answer is buy one of those egg replacers that are commercially available in most grocery stores or natural food stores. You can find Ener-G Egg Replacer as well as Egg Replacer from Bob's Red Mill. Bob's Red Mill Egg Replacer is made from soy and wheat. I believe the Ener-G Egg Replacer is more potato starch and tapioca flour. These both work very well for baking but I don't think they satisfy the omelette issue. I also read that you can use ground flax seed and water that you prepare by simmer it til it gets thick, letting it cool and using it in baking recipes as well. But...back to the omelette. Further research led me to a number of recipes that are available with a quick Google. I have adapted my own recipe to ensure that it is vegan. baking powder, yeast, turmeric and salt. Mix it well - until thoroughly combined. and add the onion, bell pepper and mushrooms. peppers - about 4 minutes. the batter to distribute evenly. 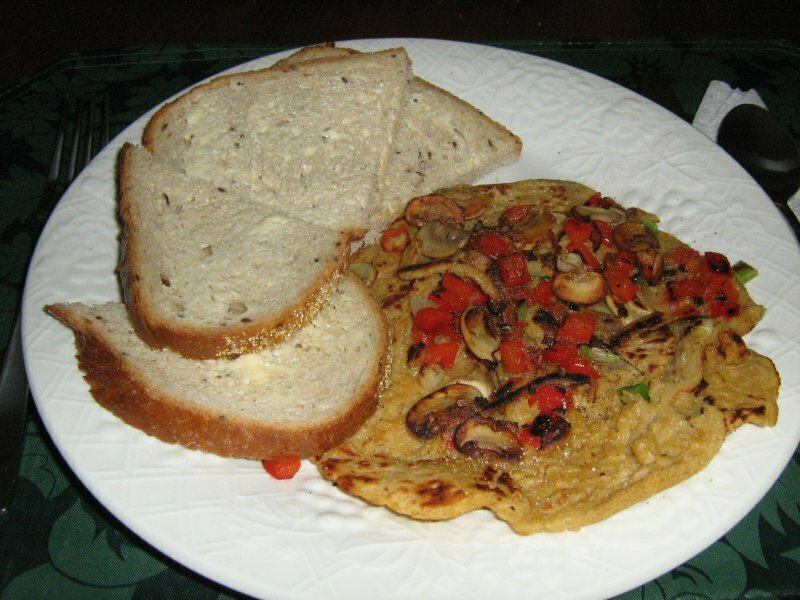 veggies cook into the omelette a little and serve it open.